The Integrated Control Panel is a USB plug-n-play device, it appears on the computer as two game controllers, and there's a backlight output interface built inside. The game controllers work with all games which support Microsoft DirectX. And a dedicated software provides access to controlling the backlight as well as configuring various advanced functions in the game controllers. ICP hardware is sold in a few modules so that hard-core home cockpit builders can make the most out of their own real aircraft parts by not purchasing them from us. All the parts purchased by the same customer will be pre-assembled and fully tested before shipping. 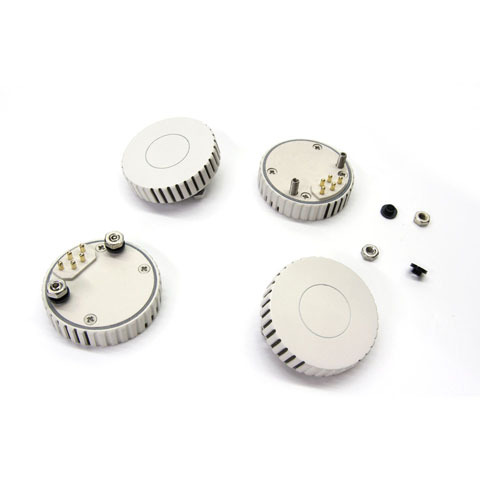 The hardware comes in two versions: a U.S version with an open-edge aluminum back plate, and a NATO version with a more enclosed back plate plus an optional IR sensor. This following illustration should help you understand our design. It may appear intimidating at the first glance, and it's common if you have doubts and questions at this point. The following FAQs should help you with most of them. I'm not a DIY kind of guy, just want a full ICP. Do I have to read all this? You still need to decide between a U.S and a NATO version and whether you need the IR sensor if you want the NATO one. Once you've made up your mind just go ahead and tell us about it in a mail. We will take care of the rest. The product will be fully assembled and tested when you get it. However, we still recommend you read through this FAQ so you won't miss important stuff. 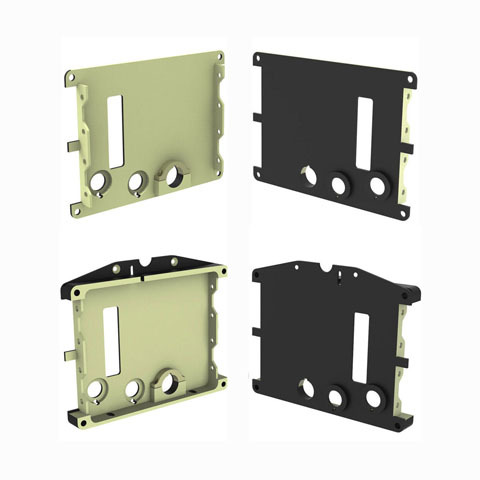 What is a back plate, and why do I need it? The back plate is the chassis of the ICP. It has mounting holes for the front panel, the main controller board, the thumbwheels and the switches at the bottom so they can be held together with screws. More importantly, it has a hole in each of the four corners so the entire unit can be mounted onto the real F-16 Head-Up Display, just like how it's done on the real jet. What's the breakout box for? And why is there an RJ45 cable, does this thing work with Ethernet? No it doesn't take Ethernet and please don't plug that RJ45 cable into your ordinary Ethernet devices. The ICP requires two power supplies and a USB connection to make full use of its functions. It takes three bulky connectors which can't fit inside the confined space between it and the HUD. The RJ45 cable is used to relay power and signal further outside of the HUD with the help of the breakout box. There's a tab with a slot on either side of the breakout box so it can be easily mounted anywhere on the framework of the home cockpit if you wish. What are all the "modules" and why are they divided in this way? There are lots of hard-core cockpit builders who have gone through great lengths over many years to collect bits of parts from the real jets and they may already have the back plate or even a set of thumbwheels. That's why we've made the back plates and the thumbwheels two separate packages, or "modules" mentioned above. The main controller board - though separated by the back plate from the front panel - must come with our front panel in a same module because they are designed with a pair of special board-to-board connectors and cannot work with other solutions. As a result, we've ended up with a basic module, the back plate and a thumbwheel module. Are the 4-way DCS switch and those toggle switches included in any of the modules? No, it is known by many resourceful pit builders that those switches have always been hard to get by. Otto makes them, not us. We may help you source them if it's really difficult for you to get ahold of any. And we may help you solder them to the wire harnesses for free. But we are not like Mouser or Digi-key who are dedicated in reselling components. If you require those switches, please emphasize. How many thumbwheels do I need? A complete ICP requires a total of four thumbwheels. Two on the left and two on the right. The ones on the left look and function differently from that on the right, they are not interchangeable. In Falcon BMS, the bottom right side thumbwheel hasn't been simulated yet. But on our ICP hardware, the bottom right thumbwheel works as a regular joystick axis. And you may assign it to anything or leave it unused. What's the IR sensor for? Why do I need it? Frankly, we're not sure what purpose it serves on the real jet. Some say it's an IR emitter for the NVG system, some say it's a sensor for automatic dimming of cockpit/display brightness. Anyway, we've built this part to make the NATO version look more realistic. Just consider it a 1:1 scale model. You will need it if you feel like having an extra eye-candy with your NATO ICP. Can I take it apart and see what's inside when I get mine? It's built to withstand repeated disassembly/re-assembly as long as all are done properly. However, we wouldn't encourage that, as the ICP rarely require any maintenance, and it takes a lot of practice to get everything right while doing it because of the compact structure and the sheer number of parts involved. You would risk damages to parts which voids your warranty. Nevertheless, just to satisfy your wish for a little peak inside, we've done it for you so you won't have to. Here is a whole album of photographs called "Anatomy of the Integrated Control Panel", enjoy them. Please check out the following links to learn more details about each module. If you have questions regarding how to place an order, please proceed with our FAQs about orders and payments.